Clarke has been helping cleaning professionals increase cleaning effectiveness and productivity for 100 years. Now we are pleased to introduce the SA40 stand on scrubber to further enhance your cleaning productivity. 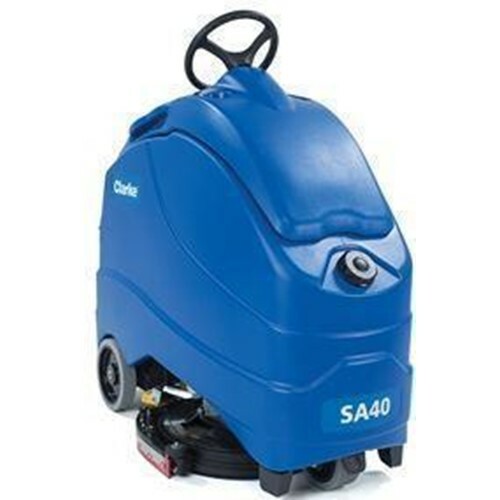 Designed to deliver reliable cleaning performance, the SA40 stand-on scrubber provides a flexible, extremely maneuverable and compact solution for small to medium-sized areas. Clarke has set the standard for robust, productive, easy to use and reliable cleaning equipment. The Clarke SA40 is designed with a large 12 gallon solution tank and low flow rate, which can provide up to 75 minutes of scrub time without refilling, so you will spend more time cleaning. The SA40 is also engineered to provide increased down pressure at 75 pounds to enable you to enjoy maximum clean in a single pass. The SA40 ensures consistent, reliable cleaning with solution flow rate control right at your fingertips. Select from low, medium or high flow rates to match the job at hand without stopping the machine. This not only minimizes cleaning solution waste but also reduces time spent on dump and refills. For simple operation, all scrubbing parameters-brush pressure, solution flow and vacuum are controlled with individual buttons, and are clearly displayed on the easy-read, LDC graphical display. With the SA40 you can enjoy a high level of cleaning performance without sacrificing sustainability. The SA40 is designed to allow you to clean with minimal consumption of detergent and water so that real savings can be gained without compromising performance or the environment. All Clarke auto scrubbers feature important benefits such as low noise levels, enhanced user ergonomics, on-board chargers and superior pickup to ensure you are left with clean, dry and safe floors. Simple, intuitive controls minimize operator training. Flip-up lid and tilt-back tank provides easy access to the recovery tank, debris catch cage and batteries. Externally mounted solution filter is easy to clean and minimizes exposure to chemicals. The scrub deck features a rugged industrial 3-lug attachment system for maximum durability and low total cost of ownership. The SA40 is available with wet or AGM maintenance-free batteries. The clam shell design makes charging easy, with virtually no increase in the machines foot-print. This allow it to easily fit into a cramped janitors closet. Large recovery tank opening, complete draining and smooth interior for easy cleaning. Front fill port allows easy, flexible tank filling. Front polyurethane tire for outstanding traction and high durability. Wrap-around squeegee ensures 100% water pick-up and dry floors. Quiet mode for daytime cleaning and cleaning of noise-sensitive areas. Safety dead-man switch and GO pedal provides easy-to-control operation. Rear rill port allows easy, flexible tank filling. Low foot platform height for easy on/off. Rear polyurethane tires for outstanding traction and high durability.